The ears can hear everything, from the faint ticking of a small watch to the roar of a jet engine, a range of volume of nearly one million to one! It is fitting that one of the most marvelous organs in the body should be used to hear the Word of God. To understand how our ears hear sound we must first understand something about sound itself. Most sounds are produced by something vibrating, such as vocal cords or loudspeakers. These vibrations produce compressed pulses of air molecules that bump into other air molecules, which in turn bump into others and continue in this way until they reach our ears (Figure 1). The ear of a young person can sense as few as 20 pulses per second (for low-pitched sounds) and as many as 20,000 pulses per second (for high-pitched sounds). Long before the radio was invented, the ear was designed to convert pulses of air into electrical signals. 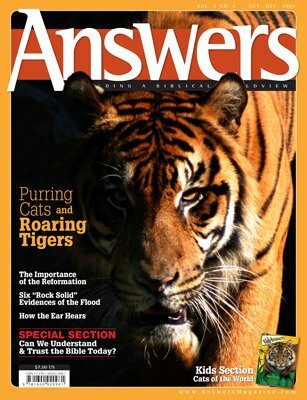 To accomplish this marvel, God gave the ear three parts—the outer ear, the middle ear, and the inner ear (Figure 2). Each part has a different role in locating and converting signals that our brain can use. In a series of complex steps, these three parts are designed to conduct sound through three radically different media—air, bone, and fluid (mostly water). The outer ear includes the pinna, the ear canal, and the eardrum. The part of the ear that we see, called the pinna, is commonly known simply as the “ear.” It has a complicated cup-like shape designed to catch the sound waves from the air. Having two ears helps us to detect what direction sounds come from. Not only can they detect sounds from the left or right, but our pinnae can detect sounds in front, behind, above, or below us. The ear canal is about 1 inch (2.5 cm) long and a little over 0.33 inches (0.8 cm) in diameter. It efficiently channels sound waves to the eardrum. Lining the ear canal are special glands that produce earwax (cerumen). This wax lubricates the ear canal, preventing irritation and fighting bacteria. For most people, the ear canal is self-cleaning. Ear wax traps dust particles, which are then removed from the ear canal (along with the wax) by an amazing conveyor-belt mechanism. The eardrum (tympanic membrane) plays the final and starring role in the outer ear. 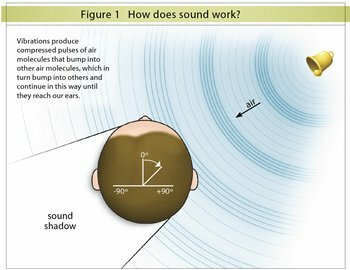 Sound waves entering the ear canal cause the eardrum to vibrate. The minute movements of the eardrum are then passed on to the small bones in the middle ear. The function of the middle ear is to amplify the sound vibrations of the eardrum. The vibrations must be compressed into a much smaller area. 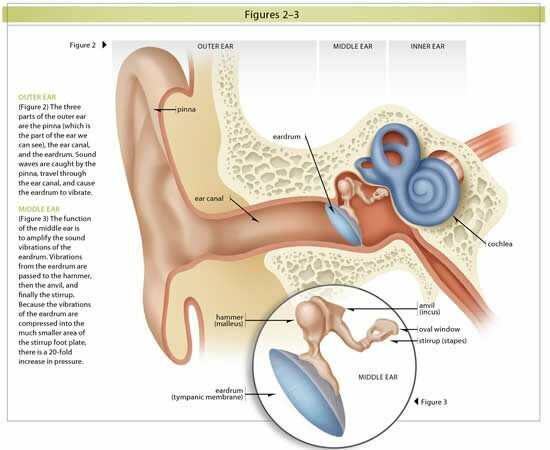 This is accomplished by a sequence of three small bones in the middle ear, known collectively as ossicles (Figure 3). The ossicles are the smallest bones in the body (the smallest bone weighs .0001 ounces (0.3 cg)). They are the only bones that never grow larger from the time of birth. Vibrations produced in the eardrum are passed to the first bone, called the hammer (malleus), whose “handle” is attached to the eardrum. This bone, in turn, passes its vibrations to a bone called the anvil (incus). Next, the vibration is transmitted to a bone that looks like a stirrup, called the stapes. Finally, the “foot plate,” located on the stirrup, is inserted into a small oval window, which opens into the inner ear (Figure 3). Amplification results because the surface area of the eardrum is much greater than the foot plate of the stirrup, thus concentrating the energy over a smaller area and resulting in over a 20-fold increase in pressure. The foot plate moves in and out, like a piston, producing waves in the fluid of the inner ear. The bony chamber of the inner ear is shaped like a small snail shell, from which it gets its Latin name cochlea (Figure 4). The function of the cochlea is to take the mechanical vibrations from the ossicles (and ultimately the eardrum) and convert them into electrical signals understandable to the brain. Inside the cochlea are three canals. The middle canal is a spiral, filled with a special fluid. Running within this spiral canal is yet another fluid-filled channel called the cochlear duct (Figures 4 and 5). As the piston movement of the middle ear causes waves to travel through the fluid in the cochlea, the cochlear duct bounces up and down. Inside the cochlear duct is a strip of tissue known as the organ of Corti, one of the most remarkable organs in the body. It is very complex but worth the effort to try to understand it. Here the ear converts signals at the molecular level. 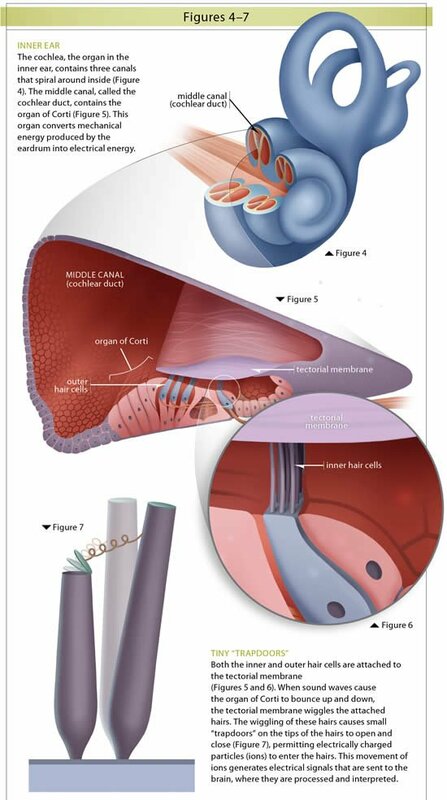 This organ essentially consists of three rows of outer hair cells and one row of inner hair cells (Figure 6). The tops of the cells have tiny “hairs” (thus the name “hair cells”). These hairs are actually cilia that are much smaller than a hair on our bodies. In fact, they are too small to be seen individually, even with a light microscope. The tips of some of the hairs are attached to an overlying spiral membrane called the tectorial membrane (Figure 6). When the organ of Corti bounces up and down, the tectorial membrane wiggles the hairs. The wiggling of the hairs causes small molecular “trapdoors” on the tips of the hairs to open and close, permitting electrically charged particles (ions) to enter the hairs (Figure 7). Incredibly, the molecular trapdoors are controlled by molecular springs that attach to adjustable molecular brackets. It staggers the mind to think of tiny molecular trapdoors opening and closing at a rate between 20 and 20,000 times per second, admitting charged ions into the tips of the hairs. This movement of ions generates electrical signals that are sent to the brain, where they are processed and interpreted. The Bible declares, “The hearing ear and the seeing eye, the Lord has made them both” ( Proverbs 20:12 , NKJV). It logically follows that God, who made the hearing ear, is Himself able to hear. The Psalmist asks, “He that planted the ear, shall he not hear? He that formed the eye, shall he not see?” ( Psalms 94:9 , KJV). Indeed, the Creator is not limited by physical ears and eyes. He can hear our very thoughts and see into our hearts. 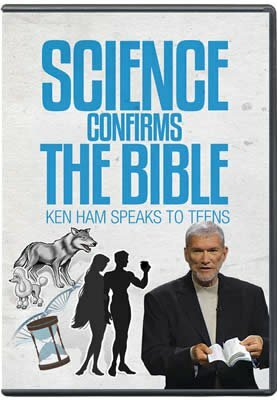 This is a frightening thing for the unbelieving sinner, who would not want a perfect God listening in on his every word and thought. But for the believing Christian whose sins have been covered by the blood of Christ, a hearing (and seeing) God is a profound blessing and comfort. God sees our needs and hears our prayers. “The eyes of the Lord are on the righteous, and His ears are open to their cry” ( Psalms 34:15 , NKJV).